Did you know you can now order your Deliveroo takeaway from Massis Lebanese Grill and Bar here on View? 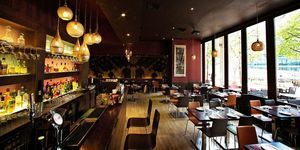 Situated in the heart of Paddington Waterside is Massis Lebanese Grill and Bar. Here you will find a wide choice of Lebanese dishes where the focus is on the authenticity of the cuisine. A great selection of drinks is available including Massis signature cocktails. Very modern and comfortable outdoor area, on a south facing terrace. 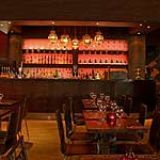 What did you think of Massis Lebanese Grill and Bar? we went as a group of 5. The decor and initial atmosphere was inviting and pleasing. The mezze's or starters were expensive at £6.50/£7.00 each. The portions were small. The main dishes we looked at were £20 each so i was expecting very tasty food. As a vegetarian there was a large selection but the vegetarian dishes were bland and tasteless. The meaty dishes were tastier. Once again for a main dish priced at £20 i was expecting a larger portion but it was small for that price. Halfway through the meal a belly dancer appeared. i felt as though i was in a lap dancing place and felt extremely uncomfortable as she danced from table to table encouraging people to get up and dance. that really put me off my meal. it was not the time or place for that sort of entertainment. lastly the music was so loud we could not hold a proper conversation with ourselves. i will not be going there again. ideal for stag parties who are generally drunk, are not looking for good food and who dont mind having a half naked woman parading around. I visited Massis recently with a large group of people (around 17). We had pre ordered our food as requested as we were such a large booking which I thought was fair enough. I was genuinely excited to try this place as I loved the sound of all the dishes on the menu, sounding very similar to Turkish food I have eaten before. Unfortunately Massis does not live up to the previous reviews. I cannot fault the service and the "entertainment" of a belly dancer appearing from nowhere in the middle of our meal (!) However the food really is bad. Bland, chewy lamb (for the slow cooked Bamia), pretty much all of the dishes tasted and look like they were ready made then microwaved! Plastic bowls for the hummus, hardly any bread for the dips either. So disappointed. If this was a cheap place then I would not have minded so much, but for mezze around £6 a dish and mains starting at £13 then I really do expect a little better. Had a tacky chain feel to it and as I understand, this is only one of two restaurants in London. Sorry guys, but a lot of improvement needed for the food! Won't be coming back. Hi Taleb would just like to say once again for a fantastic evening on the 21st May my party of 20 were very impressed with the excellent food & service we received at your restaurant, i have no hesitations what so ever in recommending your fine restaurant, we will defiantly be back next time we are in London. Kind regards Michael from Bergen Norway. Bland, mediocre food and really poor customer service. Waited half an hour from starters to main course. Long after we finished the main course they collected 2 plates from the table (there were 4 of us). 20 minutes later we had to go and ask if someone would clear the table. No apology at all. The waitress also emptied the bottle of wine into one person's glass filling it right up but leaving all the other glasses empty. They really don't have a clue. Went there for a belated staff Christmas party. 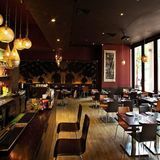 The atmosphere was fantastic, the manager's selections for our set menu were spot on and the service was very good. An overall great choice for this kind of occasions! 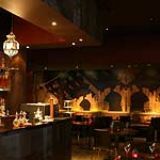 Ab fab food, really cool restaurant with an original middle eastern yet contemporary decor! We have been visiting Massis Grill & Bar, with my husband, 2-3 times a month since it opened. At first it was because it was very close to where we live but now I can safely say Massis is an absolute gem for our neighbourhood with food that is consistently amazing and very friendly service too! I went to Massis with a friend last Monday evening for the first time. I have to say that I was quite impressed with the interior which it has a much more contemporary feel than the generic decor of the Lebanese restaurants that I have been to until now. We were welcomed by a lovely receptionist who gave us a choice with regards to our table "... by the window or in our comfortable sofa - bench". We went for the latter option under the imposing (custom made, as we were informed later) wallpaper. The waiter was really keen to explain most of the menu, mainly to my friend who is not quite familiar with the Lebanese cuisine. We had the Gourmet Mezze Selection, a spectacular assortment of charcoal grilled kafta, roasted shawarma and delicious little starters. At some point we got friendly with a couple of regulars sitting right next to us that informed us that the charcoal grilled Lamb cutlets and the Farouj Meshwi(marinated char-grilled baby chicken) are also "to die for!". I will certainly make sure I try them both next time I come! In the end when we asked for an apple flavoured shisha to smoke on the terrace and we were offered a pot of their lovely Nomad's tea and complimentary baklava! In conclusion Massis was a great experience and I am sure that I will be finding my self recommending dishes to newcomers - like the above mentioned couple - very soon! Massis has been my restaurant of choice for a few months now. First for the fact that it is near the office therefore very convenient for a quick lunch or entertaining clients in a weekday evening (the belly dancers are really great). Then it's the food which I find amazing and consistent in its delicious simplicity and taste. And lastly the service which is always helpful, attentive and very pleasant! Massis Grill & Bar is definitely a great addition in the neighbourhood of Sheldon Square! Went there on a Friday night with a group from the office, the starter i ordered was the white bait. It was an amazing feat that the chef had taken good ingredients and yet some how served up a some what tasteless and bland dish. The main (mixed shawarma) was no better in fact i have had better from a takeaway kebab shop. We were given the Lebanese chardonnay described on the wine list as 'creamy and complex with notes of peaches and honey' this description failed to mention the huge notes of lemon and vinegar it was truly awful and at £32 a pop not cheap. I have definitley picked up plonk from the supermarket for less than half the price that tasted vastly superior to that. All in all the food was not great and i don't think it was good value either, the best thing at Massis was the belly dancer. If i could give no stars i would so one star thats enough for you. I've had much better fallafels, and the goats cheese mezze was extremely - and I mean extremely - salty. Also I wonder what oil they use; seemed like rapeseed oil unfortunately. Disappointing food, no problems with the service. Massis turns out very respectable Lebanese food in a business district near Little Venice and Paddington Station. Massis has a smaller, less remarkable sister restaurant just off Oxford Street. This location, the bigger, bolder and more adventurous second site, is part of a development that includes a swathe of modern offices housing the likes of Marks and Spencer. In that respect this restaurant is here to serve the local business community, but is worth hunting out if you live in the area or you are in transit through Paddington Station. There’s outdoor seating, which will be highly sought after when the weather permits, while through the venue’s large glass windows you will find a modern, smart space that wears its regional influences on its sleeve. The room, containing seating for around 50 people, has decor which will be familiar to those who have been to the eastern end of the Mediterranean or even in North Africa. 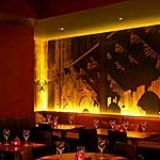 Brightly coloured little candle-lit lanterns illuminate otherwise dark corners and larger ones hang over the back-lit bar. Ornate golden teapots sit waiting to be called upon next to sleek bottles of premium spirits. It has a whiff of an upmarket chain about it without feeling contrived. The room is lifted beyond the norm by an abstract print embossed on the far wall that looks like a representation of an ancient Middle Eastern arch. Earlier on in the evening, the restaurant is sedate. Later on it starts bubbling as the room fills with the buzz of conversation and noise levels starts to rise. The staff do an excellent job of making your meal a pleasurable one. They’re happy to make recommendations, easy to strike up conversation with, and they leave you in peace when needs be. Those new to Lebanese food shouldn’t be wary of experimenting. In fact, a lot of the smaller plates (mezzes) and mains will be common ground for anyone who has eaten Greek or Turkish food. Lebanon’s position at the east end of the Mediterranean means many dishes are commonly found, but are known under different names, in many countries in the region. So, for example, you will find hummus (£4.25), stuffed vine leaves (warak inab, £4.25), mousakaa (£3.95), falafel (£4.75) and halloumi (£4.75). As is often the way with these things, the more you experiment the better your chances of stumbling across something fantastic. Step forth the mjadarrah (£3.75), a beautifully aromatic blend of pulped lentils and rice which is served cold with wispy strands of fried sweet onions on top. Spread liberally on the accompanying soft flat bread this is a definite highlight. Between two people, six dishes are suggested as a sufficient amount. If you have any designs on sharing a more substantial main then four will easily suffice. Lamb is a particularly popular meat in this type of cooking and the spicy sausage (sujuk) are little chipolata size morsels packed with lamb meat, garlic and spices. The lamb sambousek (£4.75) is minced lamb encased in a pastry that has both a pungent aroma and flavour of goat’s cheese. The menu description doesn’t mention this so it’s worth knowing in case you have any particular aversions to goats or cheese. By the time you reach the mains you may well feel like you’re fit to burst. Those with larger appetites or those willing to persevere will be richly rewarded by a list which is heavily reliant on their hot grill. Lamb and chicken dominate the meat selection but if you’ve pigged out on too much meat during the mezzes go for something off the fish selection. One will be enough (they’re big portions) between two with some rice to share on the side. The Mediterranean king prawns are the most expensive option at £16 but they’re worth it. A dozen or so carefully spiced prawns are placed around a bed of yellow rice. The Lebanese rice is actually quite plain, but when you squeeze some lemon onto it and pair with the smoky charred prawns, it all works together in a spellbinding fashion. Desserts options are scant, but their sweet and sticky baklava is oh so good. The combo of honey, pistachios and pastry is enough to make anyone throw caution to the wind. The baklava works really well with the milk based pudding of the muhalahbieh (£3), too. A glorious Don David Malbec (£25 a bottle) graces the wine list, but live a little and try the Lebanese Reserve De Couvent 2005 (£19 a bottle). Lebanon’s reputation is growing as a wine making nation and here’s a decent example why. Even if you wouldn’t normally consider it, you should call for the tea pots (£2.35 each) at the end of the meal. The Massis Orchard (apples, almonds, cinnamon and vanilla) strikes a lovely balance between being sweet and spiced. Whether you’re a newcomer to Lebanese food or an expert in the field, you’ll find something to savour at Massis.